Are You Using The Features of Your “Made For iPhone” Hearing Aids? If you wear “Made for iPhone” hearing aids, you have many useful features at your fingertips. But many people don’t take advantage of these incredible features which can greatly improve their hearing. Are you? ​Recent advances in technology have made hearing aids more user-friendly and controllable than ever before. Made for iPhone hearing aids allow the user to make personalized adjustments to their hearing aids right from their Apple product (iPhone, iPad, iPod Touch, and Apple Watch). If you wear hearing aids that connect to your iPhone (or other Apple product) but don’t feel like you are utilizing all of the features, your audiologist may be able to help you. In this article we cover a few of the popular features on the “Made for iPhone” hearing aids. But there are many useful features, and different features are suited to different patients with different types and degrees of hearing loss, activities and lifestyles. 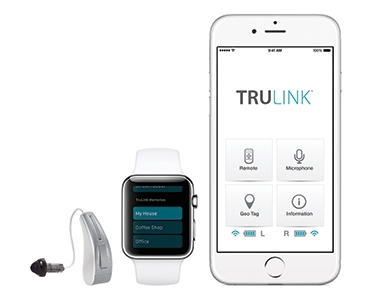 Your audiologist can review the TruLink app and hearing aid features with you, and help you get comfortable with the features best suited to you. If your hearing aids are paired with an Apple product, the first step is to understand that the connection is dependent on the iPhone and iOS (operating system) functionality. Certain versions of iOS may have issues that can affect the Bluetooth connection to your hearing aids. Updating your iOS when a new version is released is the best way to overcome any connection issues. Before updating your iOS you want to unpair your hearing aids from your phone, download the update, and then re-pair your hearing aids with your phone. Your audiologist can help if you have any questions when preparing to download an update, or with pairing your hearing aids with your iPhone. Another great feature available with the Made for iPhone hearing aids is the Remote Microphone capability. This feature allows the hearing aid user to turn their Apple product into a microphone. Any audio picked up by the Apple device’s microphone will be directly streamed into the hearing aids. Those with a more severe hearing impairment may find this feature beneficial in increasing the signal-to-noise ratio of speech. During a lecture or ceremony, place your Apple device on the podium near the speaker to hear their voice better. At dinner, place your Apple device on the table in front of your dinner companion to hear the conversation better. When riding in the back seat of a car, place your device in the front seat to hear the driver and front seat passenger better. These are just a few tips and tricks that you may find helpful with your smart phone hearing aids. ​Schedule an appointment with your audiologist to learn more!